While visiting education.com one day I came across a Baked Crayon Art (directions found by following the link) activity that looked fun and I had to try it. So I set the activity up for my kids and they went to work . Ariel's task to was help peel all the crayons. Michael tried but quickly lost interest. Paper isn't sturdy enough for this project, so we cut the sides off an old cereal box. We covered some cookie sheets with foil in case the crayons melted over. Ariel was more deliberate in the placing of her crayons and objects. She even used foam letters to "sign" her name. I warned her that once the crayon melted, it probably wouldn't look the way she wanted but like any typical 8 year old, she knew better then me. 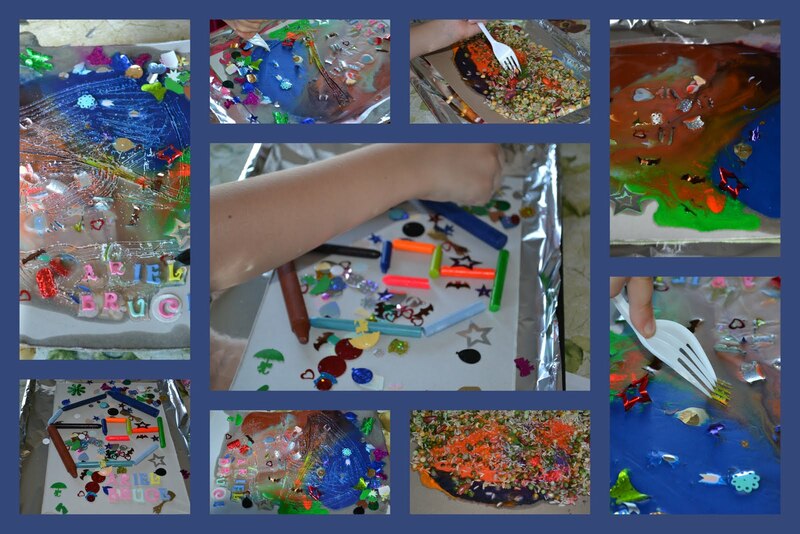 Michael tried using stickers, foam pieces, and an old rice and bean sensory mix for his art. He started off placing items in specific places, but once he got to the rice and beans, he ended up coving his cardboard just for fun. Over cooling wasn't too bad for Ariel since she had plenty of room to work with her melted crayon. She found that scraping the wax could be fun too! Michael on the other hand was unable to do much more then pick rice and beans off the art. Michael's mess...umm...art. All that matters was he was proud of it! Ariel's project. She was a bit frustrated that the design she created with the crayons didn't carry over to the melted version. I did warn her! As Ariel learned, creating a design doesn't really matter. Crayons melt where they please. Don't cool for too long or you won't be able to swirl the melted crayon. If scraping is what you want, then go for it! Giving a 3 year old beans and rice to add to the project may not be the best idea as they will cover everything! I think we might just have to try this again one day...without all the added items...just crayons! This looks like a great learning experience and the end results are pretty great! I never would have thought to add all the extras but it certainly does add pizazz! This gave me an idea! What about shaving the crayon and using the shavings in the art instead of the whole crayon. And perhaps leaving it out in the sun on a very hot day. The slow melt may leave some things intact whicle the crayon melts! Love it! We will try this soon! I love it, looks like your kids did, too. We will be trying this for sure. Very cute. Thanks for stopping by my blog earlier! I'm your newest follower. Kelly @ Here Comes the Sun. Looks fun! We did a similar thing with hot rocks, heating them in the oven then drawing on them with crayons. They give a lovely smooth finish don't they. 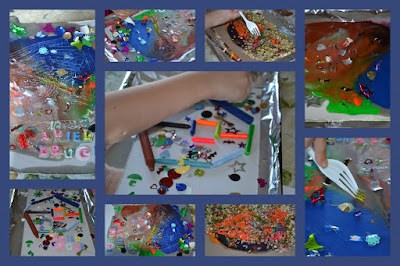 Another idea is to put the broken crayons in a muffin tin mixing the colors. When they come out they look like peanut butter cups. Tell the kids not to eat them because they look delicious! I think we preheated the oven and then turned it off before we put them in to melt. it is a learning experience when things don't meet your expectations. great life lessons too but the finished pieces sure were interesting no matter the initial intention.